Astrology, in its traditional form, is a type of divination based on the theory that the positions and movements of celestial bodies (stars, planets, sun, and moon) at the time of birth profoundly influence a person's life. In its psychological form, astrology is a type of New Age therapy used for self-understanding and personality analysis (astrotherapy). In both forms, it is a manifestation of magical thinking. has no relevance to understanding ourselves, or our place in the cosmos. Modern advocates of astrology cannot account for the underlying basis of astrological associations with terrestrial affairs, have no plausible explanation for its claims, and have not contributed anything of cognitive value to any field of the social sciences. Even so, astrology is believed by millions of people and it has survived for thousands of years. The ancient Chaldeans and Assyrians engaged in astrological divination some 3,000 years ago. By 450 B.C.E. 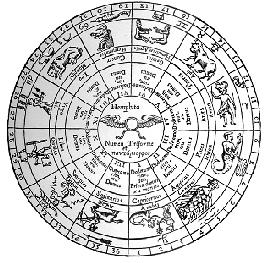 the Babylonians had developed the 12-sign zodiac, but it was the Greeks--from the time of Alexander the Great to their conquest by the Romans--who provided most of the fundamental elements of modern astrology. The spread of astrological practice was checked by the rise of Christianity, which emphasized divine intervention and free will. During the Renaissance, astrology regained popularity, in part due to rekindled interest in science and astronomy. Christian theologians, however, warred against astrology, and in 1585 Pope Sixtus V condemned it. At the same time, the work of Kepler and others undermined astrology’s tenets. Its popularity and longevity are, of course, irrelevant to the truth of astrology in any of its forms. Precession of the equinox is caused by the fact that the axis of the earth's rotation (which causes day and night) and the axis of the earth's revolution around the sun (which marks the passage of each year) are not parallel. They are 23 l/2 degrees away from lining up; that is, the earth's axis of rotation is tilted. This tilt also causes our seasons, a fact that Ptolemy did understand but that many people do not understand even today. Ptolemy understood that the rotation axis of the earth was slowly precessing, or moving in a circle, with an angular radius of 23 1/2 degrees with a period of around 26,000 years. He deduced this from comparisons of data taken by the ancient Sumerians 2,000 years before his time. He did not understand what was pushing the precession, but he did understand the motion. We now realize that the sun is rotating with a period of around 30 days and that this causes the sun to bulge at the equator, which causes a torque to be exerted on the top like motion of the earth's day and night cycle. There is also a small 18.6-year variation caused by the moon's orbit around the earth, and the moon also has a small effect on precession; however, the sun's equatorial bulge is the main cause of the precession of the equinox, which is why your sign listed in the newspaper, by Sidney Omar for instance, in most cases is removed by one sign from the modern, actual position of the sun at your birth. Sidereal astrology uses the actual constellation in which the sun is located at the moment of birth as its basis; tropical astrology uses a 30-degree sector of the zodiac as its basis. Tropical astrology is the most popular form and it assigns its readings based on the time of the year, while generally ignoring the positions of the sun and constellations relative to each other. Sidereal astrology is used by a minority of astrologers and bases its readings on the constellations near the sun at the time of birth. According to some astrologers, the data support the hypothesis that there is a causal connection between heavenly bodies and human events. Appeals are made to significant correlations between astrological signs and such things as athleticism. However, even a statistically significant correlation between x and y is not a sufficient condition for reasonable belief in a causal connection, much less for the belief that x causes y. Correlation does not prove causality; nevertheless, it is extremely attractive to defenders of astrology. For example: “Among 3,458 soldiers, Jupiter is to be found 703 times, either rising or culminating when they were born. Chance predicts this should be 572. The odds here: one million to one” (Gauquelin 1975). Let’s assume that the statistical data show significant correlations between various planets rising, falling, and culminating, and various character traits. It would be more surprising if of all the billions and billions of celestial motions conceivable, there weren’t a great many that could be significantly correlated with dozens of events or individual personality traits. Defenders of astrology are fond of noting that ‘the length of a woman’s menstrual cycle corresponds to the phases of the moon’ and ‘the gravitational fields of the sun and moon are strong enough to cause the rising and falling of tides on Earth.’ If the moon can affect the tides, then surely the moon can affect a person. But what is the analog to the tides in a person? We are reminded that humans begin life in an amniotic sea and the human body is 70 percent water. If oysters open and close their shells in accordance with the tides, which flow in accordance with the electromagnetic and gravitational forces of the sun and moon, and humans are full of water, then isn’t it obvious that the moon must influence humans as well? It may be obvious to some, but the evidence for these lunar effects is lacking. Finally, there are those who defend astrology by pointing out how accurate professional horoscopes are. Astrology “works,” it is said, but what does that mean? Basically, to say astrology works means that there are a lot of satisfied customers and one can shoehorn any event to fit a chart. It does not mean that astrology is accurate in predicting human behavior or events to a degree significantly greater than mere chance. There are many satisfied customers who believe that their horoscope accurately describes them and that their astrologer has given them good advice. Such evidence does not prove astrology so much as it demonstrates the Forer effect, and confirmation bias. Good astrologers give good advice, but that does not validate astrology. There have been several studies that have shown that people will use selective thinking to make any chart they are given fit their preconceived notions about themselves and their charts. Many of the claims made about signs and personalities are vague and would fit many people under many different signs. Even professional astrologers, most of whom have nothing but disdain for sun sign astrology, can’t pick out a correct horoscope reading at better than a chance rate. Yet, astrology continues to maintain its popularity, despite the fact that there is scarcely a shred of scientific evidence in its favor. Even the former First Lady of the United States, Nancy Reagan, and her husband, Ronald, consulted an astrologer while he was the leader of the free world, demonstrating once again that astrologers have more influence than the stars do. Sidereal astrology is the system of astrology used by some western and all Jyotish astrologers which bases their interpretation around the use of the sidereal zodiac. It was introduced to the West by the Irish astrologer Cyril Fagan in 1944 and is practiced by a minority of Western astrologers. Changing position of the vernal equinox. The red line is a section of the apparent path traced by the Sun through the Earth's year. The red/green line is a projection of the Earth's equator on to the celestial sphere. The crossing point of these two lines is the spring equinox. In 1500 BC it was near the end of the Aries constellation, in 500 BC it was near the beginning of the Aries constellation and in AD 150 (the time of Ptolemy) it was in the center of the Pisces constellation. The classical zodiac of Greek astronomy as defined by Ptolemy is tropical in nature, defining the signs relative to vernal equinox regardless of the position of constellations. Western astrology traditionally uses this system. Sidereal astrology ties its signs of the zodiac to the actual constellations. The precession of the equinoxes, a phenomenon discovered in ca. 130 BC by Hipparchus and known to Ptolemy, results in a shift between the two systems of about one degree every 70 years. The vernal equinox lay near the beginning of the Aries constellation around 500 BC, consistent with a Babylonian origin of the system. While classical tropical astrology is based on the orientation of the Earth relative to the Sun and planets of the solar system, sidereal astrology deals with the position of the Earth relative to both of these as well as the stars of the celestial sphere. The actual positions of certain fixed stars as well as their constellations is an additional consideration in the horoscope. (Over very long astronomical time scales these fixed stars are of course themselves far from stationary). Traditional Hindu astrology is sidereal, accounting for the shift of the equinoxes by a correction called ayanamsa. The difference between the Hindu and the Western zodiacs is currently around 24 degrees. This corresponds to a separation of ca. 1700 years, or roughly the centuries following Ptolemy, apparently going back to Indo-Greek transmisson of the system. At this time, the vernal equinox was approximately at the center of the constellation Pisces. Cyril Fagan assumes the origin of the zodiac of 786 BC, when vernal equinox lay somewhere in mid-Aries, based on a major conjunction which occurred in that year (ref), corresponding to a difference of some 39 degrees or days. Nearly all astrologers, tropical and sidereal, agree that the ecliptic should be divided into twelve equal segments to form the zodiac; they differ on where the zodiac begins. Thus, most sidereal astrologers simply divide the ecliptic into 12 equal signs of 30 degrees but approximately aligned to the 12 zodiac constellations. Assuming an origin of the system in 786 BC, this results in an identical system as that of the classical tropical zodiac, shifted by 39.5 days, i.e. if in tropical astrology, Aries is taken to begin at 21 March, sidereal Aries will begin on 30 April. A small number of sidereal astrologers wish to include other constellations, such as Ophiuchus, in their zodiac and use thirteen signs instead of twelve. This results in a system completely unrelated to the zodiac as described by Ptolemy. While Ptolemy has of course noted that Ophiuchus is in contact with the ecliptic, he was aware that the twelve signs were just conventional names for 30 degrees segments (especially since the Aries sign had ceased to be in contact with the Aries constellation already in his time). For the purpose of determining the constellations in contact with the ecliptic, the constellation boundaries as defined by the International Astronomical Union in 1930 are used. For example, the Sun enters the IAU boundary of Aries on April 19 at the lower right corner, a position that is still rather closer to the "body" of Pisces than of Aries. Needless to say, the IAU defined the constellation boundaries without consideration for astrological purposes. The dates the sun passed in front of the thirteen astronomical constellations of the ecliptic in 1977 are as follows. The dates will increment by one day every 70½ years and already several have changed. Because of their inclination from the ecliptic, the planets are not restricted to the thirteen constellations of the ecliptic. The seven planets (excluding Pluto, which ranges more widely due to its high inclination) pass through 21 constellations. Thus there are 21 astronomical constellations of the zodiac. These are, in addition to the 13 constellations listed above, Cetus, Corvus, Crater, Hydra, Orion, Pegasus, Scutum, and Sextans. "The Real, Real Constellations of the Zodiac". John Mosley, Planetarian, Vol. 28, #4, December (1999). Vedic vs. Western: What's the Difference?